Discover Our Exciting Summer Camp Opportunities in Spring Hill! 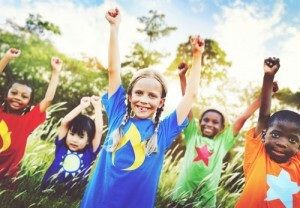 Is your child ready for summer to start? If you’re unsure of how to make the most of this break in the school year, then you’ll love to hear about our exciting summer opportunities. At Discovery Point Seven Hills, our 2019 summer camp program in Spring Hill keeps children engaged through fun and inspiring weekly themes as well as hands-on activities, adventure-filled excursions, and skill-building challenges. Your child will have a chance to make memories that he or she will cherish for a lifetime and build lasting friendships with other campers. If you’re ready to learn more about our upcoming summer camp program in Spring Hill, read below. Our “Mighty Me!” summer camp program encourages children in Spring Hill to find their own superpowers and discover the values that true heroes live by. Our creative theme-based approach to each week ties our activities and field trips into a specific theme, helping children understand important lessons from our children’s literature selections by seeing how they play out in reality. Sportsmanship. We remind students that teamwork is required in order to become a true champion. Friendship. Campers learn how respect and kindness lay the foundation for all lasting friendships. Self-esteem. Children gain confidence as they shine a light on their personal talents and begin to understand their own superpowers. Caring for animals. Children learn how they can care for animals both at home and in the wild. Brainpower. We help keep campers academic skills fresh with stimulating puzzles, games, and skill-building exercises. Imagination. Campers see how imagination plays a part in building real-life wonders like roller coasters and skyscrapers. Self-reliance. Our exciting activities and experiments help children understand the power of being self-reliant and resourceful. Health & physical fitness. We break down the science of the human body and put those concepts into action through fun physical challenges and activities. Critical thinking. Our unsolved mysteries and adventures in archeology have campers put their critical thinking caps on and their investigative skills to use. Don’t hesitate to ask for details about our summer camp in Spring Hill. Just call Discovery Point Seven Hills at (352) 686-0728 or drop by our child care center for more information about our exciting opportunities for the upcoming summer season.